Costing less than $1000 per patient, this new regimen is not only much less expensive than the current standard regimen, but it also reduces the duration of treatment by 12 to 15 months. It is expected to dramatically improve the current low cure rate and potentially decrease deaths due to better adherence to treatment and reduced loss to follow-up. MDR-TB is defined as TB that is resistant to at least rifampicin and isoniazid—the two most effective drugs for treating drug sensitive TB. Resistance generally stems from inadequate treatment or improper use of medicines. MDR-TB can also spread directly from one person to another. MDR-TB is difficult and expensive to treat, and can also be fatal. 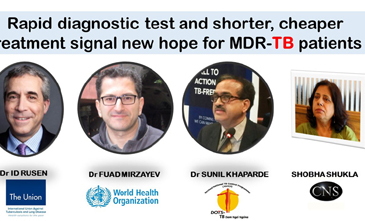 According to WHO’s Global TB Report of 2015, 5% of all global TB cases are of MDR-TB. This translates into 480,000 cases every year. Only 25% of these are detected and put on treatment, and only 50% of those treated are cured. Although formal clinical study for the shorter regimen has not been conducted in India, but Khaparde assured that very soon the proposal for roll out of this new regimen will be put up before the expert committee. José Luis Castro, Executive Director at The Union, has rightly remarked that, “Statistics clearly show that MDR-TB is an increasing burden and much of this is due to a failure of basic TB control. The international TB community must advocate for investment in the expansion of quality basic services and preventative care on the frontline where it matters most. The onus is on us all to ensure that access to correct treatments, both for patients and health care providers, increases exponentially.” Countries need to move quickly to implement the new regimen by formally incorporating it into their national TB guidelines. Accurate and early diagnosis along with shorter, cheaper and more effective treatment can help countries deliver on their promises to end TB by 2030 or earlier as envisaged in Sustainable Development Goal 3.3.